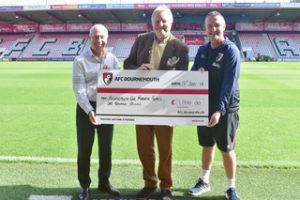 Trustee, John Kennar, was presented with a cheque recently for £1,000 from Bournemouth AFC Community Fund. This amount was applied for and granted to be spent on the Jewell Road Communal Garden. It has been used to purchase new garden furniture and the raised beds and will also contribute to the cost of the washing lines which have yet to be installed.